I have a story for you. My legs are short, my torso is normal, and jeans are always problematic. My favorite pair of jeans are skinnies from Hollister in 1 short, yet somehow they’re still too long for me by about 2 inches. I’m sure you all have so much pity for me. Anyway, I had some very faded out jeans I was super into, but their 2000-esque flair and crudely cut-off bottoms made me feel a little like a bum every time I wore them. I decided to take action and skinny them, and I couldn’t be more happy with the results! The steps were really quite simple. 1 | I turned the jeans to be altered inside-out, and laid them out, legs spread. I laid my existing skinny jeans on top, lining up the outside seams of the two jeans. Then, in a highly scientific fashion, I copied the outline of the inseam onto the jeans to be altered. 2 | Using a simple basting stitch, I followed the line I had drawn on my jeans. I tried them on (which is surprisingly difficult when they’re inside-out) and determined where I still wanted to bring the seam in a bit tighter. Once I was comfortable with the seam, I followed up with a zig-zap stitch for reinforcement. If I wanted to get more wear out of the jeans, I probably could have used a sturdier combination of stitches, but I think I’ll wear holes in the knees before the seams wear out. I cut off the excess and flipped those babies right-side-out. 5 | I folded the bottom hem over twice and stitched across the top of the fold for the cuffs. 4 | Then I modeled them, of course. I love my new skinny jeans, and they’re actually the right length for me! I think my next project will be a skinny refashion AND dyeing them a rich purple, like the skirt I did here. 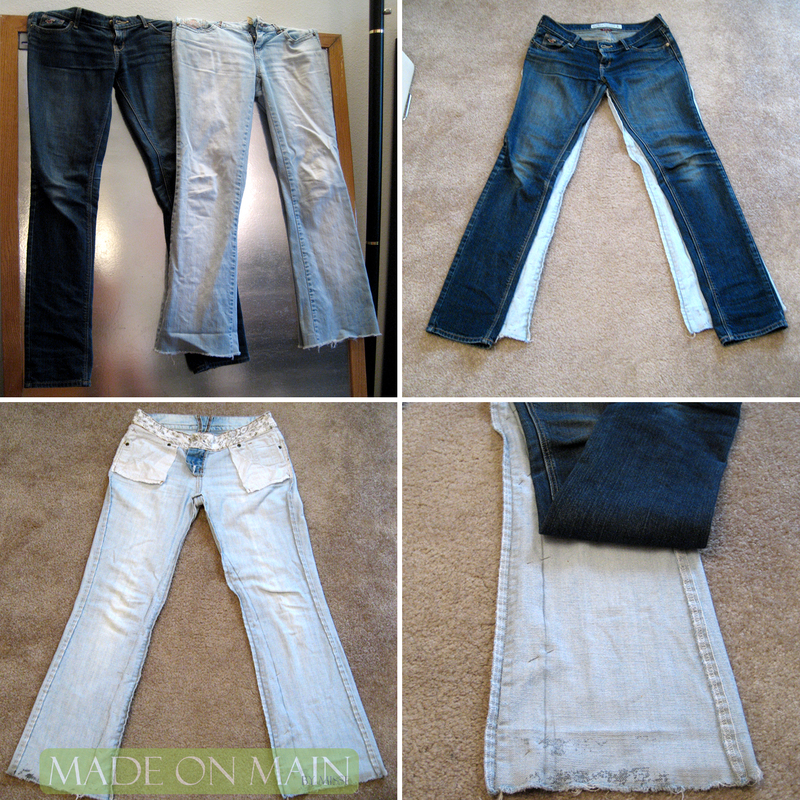 It’s such a quick and easy way to get a “new” pair of jeans! Thanks so much for having me over, Melissa!